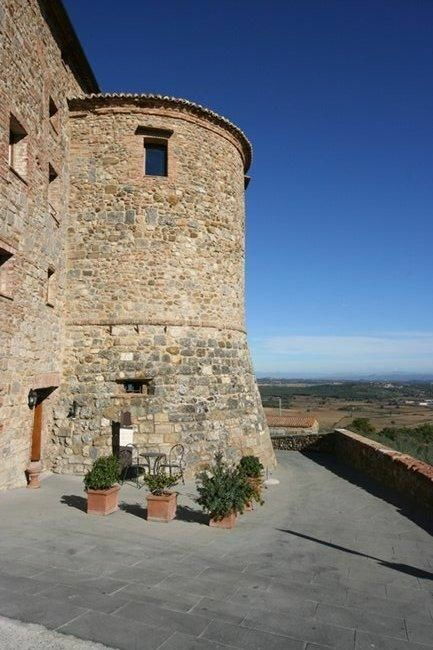 Beautiful tower carefully restored situated in the historical centre of the medieval town of Casole D’Elsa. This tower, originally a former convent dating back to the 16th century, has recently been turned into a gorgeous historical accommodation offering all modern comforts and beautifully furnished interiors. The property is situated on the ancient town walls and enjoys extensive views over the surrounding landscape. The town centre with all kind of shops is only a few meters away. The guests staying at Torre di Casole can enjoy private use of a well-stocked garden and of a Jacuzzi tub (for 4 people). The location is ideal to visit the most beautiful corner of Tuscany (like the medieval town of San Gimignano, Volterra, Siena). Distances: Casole d’Elsa with all kind of shops 150 m away, Colle Val d’Elsa 15 km, Volterra 20 km, San Gimignano 30 km, Siena 25 km, Florence 45 km away, At guests’ disposal: private outdoor area furnished with tables, chairs, sun-beds, sun-umbrellas and Jacuzzi tub for 4 people, lift connecting all tower floors, private parking (maximum 5 cars) near the property. Extra services included in the rental price:buffet breakfast, daily cleaning of the bedrooms. Small pets are allowed. Heating (when necessary) is included in the rental price. Extra services to be paid on site: food and drinks, relax area where it is possible to arrange massages, baby-sitting service, cooking classes, guided tours and excursions, transfer service from and to the airport. 650 m2 Ground floor: reception (open from 8.00 to 12.00 and from 15.00 to 20.00) where clients can ask for information about the surrounding area and for the organization of guided tours and excursions, shared room for dining and breakfast, area equipped for massages. 5 steps higher: professional kitchen usable only by a chef who is available for dinner and/or lunch service during the clients stay. 1st floor: double bedroom (where it is possible to add an extra bed) with satellite TV, telephone, safe and ensuite bathroom with Jacuzzi shower (hairdryer). 2nd floor: living-room with fireplace, bar area, panoramic terrace, twin-bedded room (where it is possible to add an extra bed) with satellite TV, telephone, safe and ensuite bathroom with Jacuzzi bathtub (hairdryer), double bedroom with satellite TV, telephone, safe and ensuite bathroom with Jacuzzi shower (hairdryer). Some steps higher: charming double bedroom in the ancient tower offering satellite TV, telephone, safe and ensuite bathroom with Jacuzzi shower (hairdryer). 3rd floor: beautiful double bedroom with satellite TV, telephone, safe, ensuite bathroom with Jacuzzi shower (hairdryer), and access via a staircase to an open gallery where it is possible to add an extra bed. This bedroom has also access to the outside. Additional costs paid on site: Security deposit: € 1.000,-Final cleaning: included Heating: included.